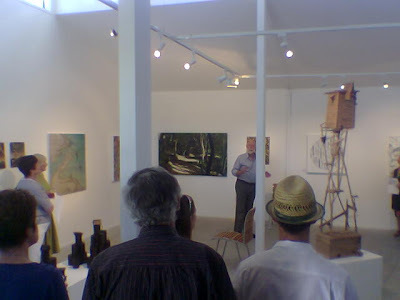 After a week of openings at the Art School here in Whanganui, I drove over to Hawkes Bay to Judith Anderson's country gallery in Hawkes Bay for the opening of Seen This Century, an exhibition of artists from Warwick Brown's recent book. Here's a snap of Warwick Brown delivering the opening speech. Ben Pearce's Great Grandfather's Clock is to the right.